From the Carolinas to Canada, the East Coast is keeping a watchful eye on Hurricane Earl's every move. 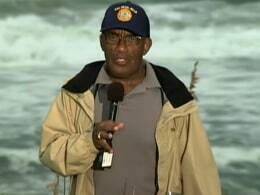 NBC's Al Roker reports. This content comes from a Full-Text Transcript of the program. BRIAN WILLIAMS, anchor: And right on schedule, it's starting to get sporty along the outer banks of North Carolina , where Al Roker is in Kill Devil Hills . And, Al , I don't need to tell you, just a difference of one degree and you're going to have 110-mile-an-hour winds coming in right in over top of your head. into Cape Cod. Brian: All right, Al Roker . You get ready to hunker, my friend. We'll see you on the other end of this storm.